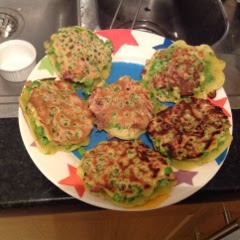 I loved these fritters. They are so easy to make and very tasty. 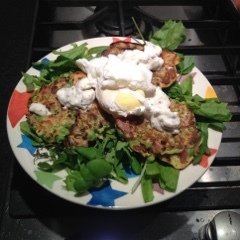 I served them on a bed of salad leaves with a poached egg. Yum! Put the peas into a saucepan and pour over a just boiled kettle of water. Leave to sit for 2-3 mins. Drain the peas and then mash or puree them roughly - you want a mixture of whole and crushed peas. Put the flour and baking powder in a large bowl and season with salt and pepper. Break in the eggs. Using a fork break up the eggs and then mix into the flour until it is all mixed together. Add the milk and whisk to make a smooth batter. Stir in the peas and ham. Heat a large frying pan and spray with cooking spray. Add tbsp of the batter spacing them well out. Cook for 2-3 mins until they are browned underneath, then flip over and cook the other side. Remove and keep warm whilst you cook the rest. Stir the mustard into the yoghurt to make the sauce and serve with the fritters.